If you could, please like Christine's Pantry page on Facebook. Help spread the word. Thanks! The California Avocado is a native American plant with a long, distinguished history. Today, the most popular variety is the Hass. The mother tree of all Hass Avocados was born in a backyard in La Habra Heights, California. The avocado (Persea americana) originated in south-central Mexico, sometime between 7,000 and 5,000 B.C. But it was several millennia before this wild variety was cultivated. Archaeologists in Peru have found domesticated avocado seeds buried with Incan mummies dating back to 750 B.C. and there is evidence that avocados were cultivated in Mexico as early as 500 B.C. Spanish conquistadores loved the fruit but couldn't pronounce it and changed the Aztec word to a more manageable aguacate, which eventually became avocado in English. The first English-language mention of avocado was by Sir Henry Sloane in 1696. Fast forward to 1871, when Judge R.B. Ord of Santa Barbara successfully introduced avocados to the U.S. with trees from Mexico. By the early 1900s, growers were seeing the avocado's commercial potential and ever since growers, enthusiasts and researchers have been hunting for improved varieties. A search through the industry's foremost annals, in particular the California Avocado Society Yearbook, reveals that many new selections of avocado were made in the industry's infancy and over subsequent years but few had commercial significance. By the 1950s around 25 different varieties of avocados were being commercially packed and shipped in California, with 'Fuerte' accounting for more than two-thirds of the production. Even though 'Hass' was discovered in the early 1930s and patented by Rudolph Hass in 1935, it was not until large-scale industry expansion occurred in the late 1970s that 'Hass' replaced 'Fuerte' as the leading California variety. Today, California is the leading producer of domestic avocados and home to about 90 percent of the nation's crop. Most California Avocados are harvested on approximately 52,000 acres from San Luis Obispo through San Diego by nearly 5,000 growers. San Diego County, which produces 60 percent of all California Avocados, is the acknowledged avocado capital of the nation. California Avocados are grown year-round. A single California Avocado tree can produce up to 200 pounds of fresh fruit each year, approximately 500 pieces, although most average around 60 pounds or 150 pieces of fruit. Mix all ingredients. Chill until ready to serve. Enjoy! Avocado chicken salad sounds really tasty. I have been missing out on this delicious salad. The idea of blending avocados with chicken to make a creamy salad does get my attention-Yum! I have saved this recipe, definitely a keeper. Thank you, Tina! I hope you enjoy. Christine, I have been trying to find a way to wean myself into eating (and liking) avocados more. I have this weird bias against them and I'm not sure why. This sounds like a great 9and delicious!) way to try them again. I love how you've presented this in the halved avocados. Looks great! Hmm.. We love avocados and they're very nutritious but I never thought of putting them in chicken salad. I'll be trying this. Thanks! Avocado is one of my fav veggies! This looks tasty! Thanks Anita! I hope you enjoy. Yummy salad Christine. Love the presentation as well. Your recipe is a keeper C! Love combining chicken and avocado! 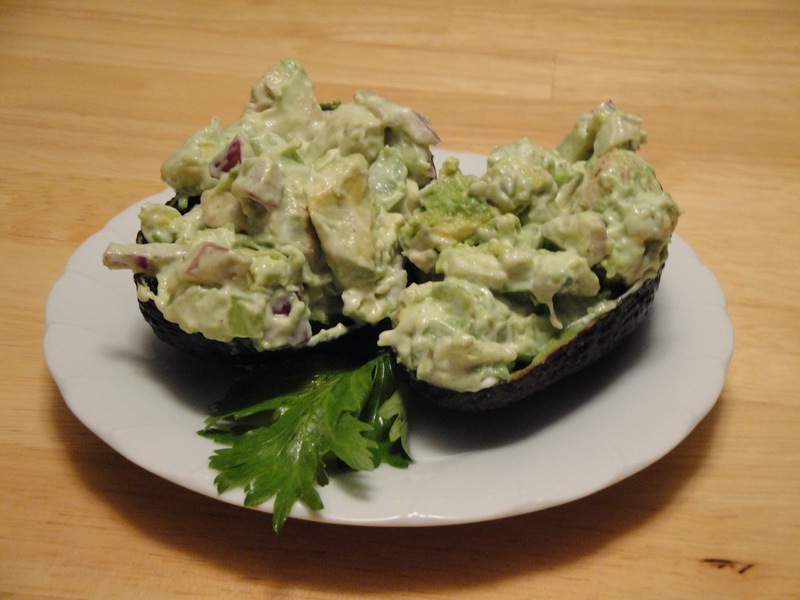 Avocado and chicken salad are two of my very favorite things...what a GREAT idea to combine them! Thank you Baker Street! I hope you enjoy! Yum chicken and avocado is a perfect combination!! This sounds great! Just bought some avocados. Love em in a salad. Very nice. We love avocados in guacamole with browned ground turkey. next time we'll have to try the avocado nad chicken combo. Great idea! Chicken and avocado - what a perfect combination! Delicious recipe, Christine! I wish I could! I love cooking and sharing. Yes, it's Christine's Pantry fan page on Facebook. Thanks! This sounds completely fantastic. I love chicken salad and this is a lighter way to enjoy it. Delicious! This is a simple and easy summer salad. I will certainly give this a try. All the ingredients are easy to have on hand. Thank you, Tumbleweed Contessa. I hope you enjoy. I can see this in my lunch bag for the next week...great idea! What a great combination. Maybe I'll do this today with an avocado I really need to use! Thanks for the idea. Thank you Grubarazzi! I hope you enjoy. This is a lovely recipe, Christine. I'm alway wondering what to do with my avocados... this is a great idea! I'm a big fan of chicken salad and yours looks great, Christine! I'm so addicted to avocado! I had a dish like this in Mexico, only with shrimp rather than chicken. But I have some leftover chicken from last night's supper so I'm going to try it with chicken. I'm sure it'll be a yummy lunch!